I recently returned from a week-long trip to South Dakota. 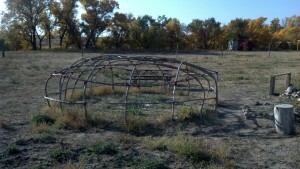 I went to the Pine Ridge Indian Reservation near the town of Wanblee to spend time with my mentor and teacher. I journeyed there to learn and to find how to better help and support the health and happiness of people and the Earth. During this time in South Dakota my mentor and I did many nights of ceremony. Through the week of ceremony we watched the full moon wane as the nights passed and the air cooled. Each night we held Inipi ceremonies, what many people call a sweat lodge. The Inipi represents life and is considered to be the womb of the Earth. It is a place for us to be reborn. For those that don’t know, an Inipi is a dome like structure which is completely covered in blankets, except for a door to the west. The ceremony includes various types of tobacco offerings and prayers. During this ritual people sit inside the dome structure and stones heated in a fire are brought into a central pit within the structure. An “intercessor” pours water on the stones and everyone present is bathed in the steam. There is typically a Helper outside the structure which brings the stones from the fire, hands in the water buckets, passes the Sacred Pipe, the drum and any other needed sacred tools. What I realized is that while my mentor is pouring water on the inside of the structure there is a Helper (doorkeeper) on the outside doing his/her work. The water pourer is coordinating everything on the inside and the doorkeeper is taking care of what is happening on the outside. They are both working hard and they both have jobs to do. In a flash I clearly understood that the Inipi ceremony represents what is happening in both the physical and spiritual world and how they interact. For example, the inside of the Inipi is the physical world and the outside of the Inipi represents the spiritual. The people who are sitting inside the structure are the people living in the physical world and people who are working outside are in another dimension of life – the spirit world. Symbolically, whoever is pouring water is working in the physical dimension while the doorkeeper is working in the spiritual dimension. Through the west door they interact, passing items and energy between the different dimensions. The water pourer is the “Holy Person” and the doorkeeper is the Spirit Helper. Inside the lodge I also saw that the Holy Person needs a physical Helper (my position during this ceremony). The rest of the people present inside the Inipi are living their lives and being supported by the Holy person, his Helper, and the Spirit Helper(s). This is the symbolic model of what is taking place in the life. I also saw that to sit in the place of the water pourer (Holy Person) that you must have a Spirit Helper. Later I spoke to my mentor about this and he confirmed all of this. This insight helps me to understand just how important the roll of the doorkeeper is. It is a highly honorable place. The other thing my mentor said was to have a woman doorkeeper is a bonus. I’ve been thinking about how this relates to having a woman Spirit Helper. and thanks 4 sharing this!!! Thanks again 4 all you have passed to me & us…hope 2 see you in 2013!? Thanks! I hope to see you before 2013. Perhaps in Nov. 2012!